Hello and welcome to the very first article of Tet Zoo ver 4, and big thanks if you're here because you followed the link at the final ver 3 article. Yes, it’s happened – I could no longer stay at Scientific American and have had to move and go independent. More on that in a minute. A really old banner I prepared for Tet Zoo ver 2 and used there for a while. It features various items specially relevant at the time (May 2011), much of it involving Wealden theropods (on which more soon). Image: Darren Naish. After numerous discussions and deliberations, I’ve decided that the best option for the continuation of Tet Zoo is to host it here, at tetzoo.com, and thus to have it sharing the same platform as the podcast. Given that blog articles are very swiftly going to outnumber podcast episodes (there are only 69 of the latter at the time of writing), it won’t be long before this site becomes obvious as the home of the blog, not just the home of the podcast. And if, so far, you’ve only listened to the podcast and never read the blog, well, now maybe you’ll become better acquainted with the blog. I should note that this site will likely get a redesign in time so that it looks more blog-themed. 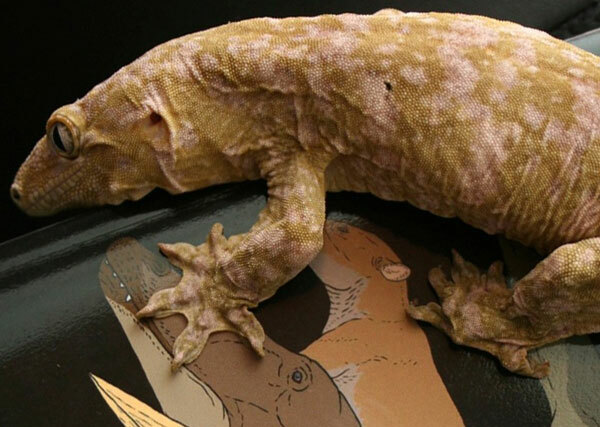 A Rhacodactylus gecko climbing on a copy of Tetrapod Zoology Book One, of course. One day I'll be able to publish the follow-up volumes to that book. Image: Ethan Kocak. If you’re new here, what do I cover? Tetrapod Zoology features longish and semi-technical articles – reviews, discussions, musings and such – devoted to tetrapods of all sorts (amphibians, reptiles, birds, mammals, living and extinct, and all of their extinct relatives). Popular topics include dinosaurs, obscure evolutionary models, interesting and little-known aspects of animal behaviour, conservation biology and cryptozoology. I also write about relevant books and toys when the time is right. I mostly avoid writing about ‘newsy‘ stories, only because they get covered at a million other places and writing about them typically feels unoriginal and predictable. Having said that, I will cover newsy things when I feel I have stuff to stay that isn’t being covered elsewhere. I approve of fan-art. I'm not sure if this counts (it's from a Christmas card for the Centre for Fortean Zoology, designed by Mark North), but it's a worthy addition. I'm playing the role of the 'Darrenadon' in an on-stage version of The Lost World. Image: Mark North. Community-relevant things – announcements relevant to our annual TetZooCon and other appropriate conferences and meetings – also get covered here. On that note, as a denizen of the TetZooniverse (such as it’s known), do consider coming along to TetZooCon if you can, it’s great. The 2018 meeting is happening on the 6th and 7th of October at The Venue, Malet Street, London, and is by far the biggest so far. Go here for more information on the meeting, and on those of previous years. Tapirs. Tet Zoo loves tapirs. Image: Darren Naish. A Quick History of Tet Zoo. For those who don’t know, Tetrapod Zoology started life on January 21st 2006 when, while unable to sleep at 1am (I was in the final throes of writing my PhD thesis at the time), I got up to eat biscuits and start a blog. I was inspired by the blog-writing of one of my longest-standing friends, but I’ve opted to keep secret who that is in order to minimise the impact on his ego. Tetrapod Zoology was launched at blogspot, the first article ever being a hello and the second being devoted to the topic of megafaunal predation in eagles. The site went from strength to strength, quickly building up a good community and a large readership. Screengrab of part of the first ever 'proper' Tet Zoo article, the killer eagles one of January 2006. That weird photo of me holding a bottle was taken at a conference held at the Natural History Museum, London; I think by Richard Forrest. In fact, such was its success that – within that first year – it had come to the attention of those running the biggest and best scientific blogging collective of the time: ScienceBlogs (Sb from hereon). I was invited to join, and Tet Zoo ver 2 launched there on January 23rd 2007, things immediately kicking off with a discussion of blood-feeding in oxpeckers. I was now being PAID TO BLOG: Sb ran a system whereby you were paid according to number of monthly hits, there being incremental tiers corresponding to payment. Despite being in the top 5 most-hit Sb blogs, we’re talking about monthly payments of $150. Better than a poke in the eye, but not exactly enough to pay the bills. An ominous portent of things to come -- my beloved ScienceBlogs mug suddenly made a cracking noise one day and split neatly in half. Read down to see what this was, err, portenting... is that a word? Image: Darren Naish. ScienceBlogs was a great group to be part of. Constant encouragement and support from Bora Zivkovic, our benevolent blogfather, and a healthy backchannel discussion group involving a large number of the Sb bloggers, created a good, healthy community. My personal situation at the time meant I could blog pretty frequently, and a (mostly) well designed, user-friendly comment system resulted in long, excellent comment threads often containing more insight and information than the articles they were appended to. I will admit to being continually miffed by the fact that the site’s two highest-hitting bloggers – PZ Myers and Greg Laden (neither of whom I have anything against personally) – seemed to blog randomly about all manner of things that were either not really scientific or were outside their area of expertise, but such it is and always will be. No offence guys. But it was not to last. A few events – most notably PepsiGate (in which the Sb overlords opted to run a commercial blog written by Pepsi alongside the other blogs) – resulted in meltdown during the latter part of 2010, and bloggers jumped ship. New collectives were created, and Bora founded a new science blog hub at Scientific American (SciAm from hereon). I was invited, and Tet Zoo ver 3 launched there on July 5th 2011. Awesome – a continuing stint of paid blogging (now we’re talking about $200 per month, eventually upped to $500). My contract at SciAm has required the publication of four articles per month, which is doable but often difficult given how many other things I now have going on (freelancing, consultancy, authoring, editing, research). But, here we are at another new location, so my time at SciAm was not to last. Why? Screengrab of part of the very first article at Tet Zoo ver 3, the SciAm years (2011-2018). The third (and final) part of the Tet Zoo 12th birthday review - published at Tet Zoo ver 3 - is currently offline because of image permission problems (read on). The article will have to be published here, at ver 4. Here's one of the photos from that article. It shows the High Tatras, Poland. Image: Darren Naish. But it’s two things in particular that have forced me to leave. The first concerns commenting. SciAm, very obviously, is not interested in hosting comment sections. After months of discussion it was obvious that they were never going to get rid of an awkward (and often semi- or non-functional) login system. By merely including a login, you’re losing virtually all of your potential commenters, many of whom will only comment when it’s quick and easy to do so. I asked repeatedly about this. And I found, to my surprise, that virtually all other SciAm bloggers had or have no interest in commenting either. I realised eventually that this is because those people – no offence intended – are not bloggers at all, but science writers who only want to write about newsworthy stories, not engage with their readers or build a community. I feel bad for saying this, but there it is. Over time, I felt more and more like an odd-one-out on the site. Anyway... hopefully, we will once more have a fully functional, user-friendly commenting system here. Feel free to put it to the test - we may even aim to get back to the 23 comments game. To regular readers: the rules of the past will apply here. Trolls and haters are not tolerated, charlatans and cranks are called out or muted, and I have ultimate discretion over what gets published. Seabirds: yet another group of tetrapods I've never covered sufficiently at Tet Zoo (despite 12 years of operation). Let's correct that. Here, a Herring gull Larus argentatus protests at the nearby presence of a Northern fulmar Fulmarus glacialis. Image: Darren Naish. The second issue concerns image use. In my early years of blogging, I made many mistakes and did many things that are totally unacceptable today. Within recent years, I’ve been following the rules of fair use and creative commons licences quite strictly and appropriately. But a change in policy at SciAm – forced by the larger company to which SciAm belongs (Springer Nature) – means that they’ve become unreasonably restrictive on image use, a consequence being that I was having images removed from my articles despite complying with fair use and CC licencing. Ultimately, entire articles were being removed from Tet Zoo due to such issues (they’ll be republished here at ver 4). It became obvious at this point that my style of blogging – which is contingent on the use of a large number of images, many of which are of the sort that were proving a problem at SciAm (book and magazine covers, and images from inside them) – is just not compliant with the SciAm way. There are currently over 550 in-progress illustrations at the Tet Zoo patreon. If you support me you get to see how things are coming along behind-the-scenes. I had to make the decision to leave. To say goodbye to those monthly earnings. In order to cover for the loss in earnings this would entail, I set a goal at patreon. But, in the end, I had to leave before that goal was reached. So here we are. A huge thanks to those who support me at patreon – this is now an independent blog dependant entirely on benefactor funding – and I hope that if you’re not a patron you’ll consider becoming one if you think it’s worth it. July 31, 2018 by Darren Naish.